A board foot is a wood measurement for a piece of lumber 12" wide by 1' long by 1" thick for estimating purposes. Board foot, or board feet, is commonly abbreviated as FBM, BDFT, or BF. 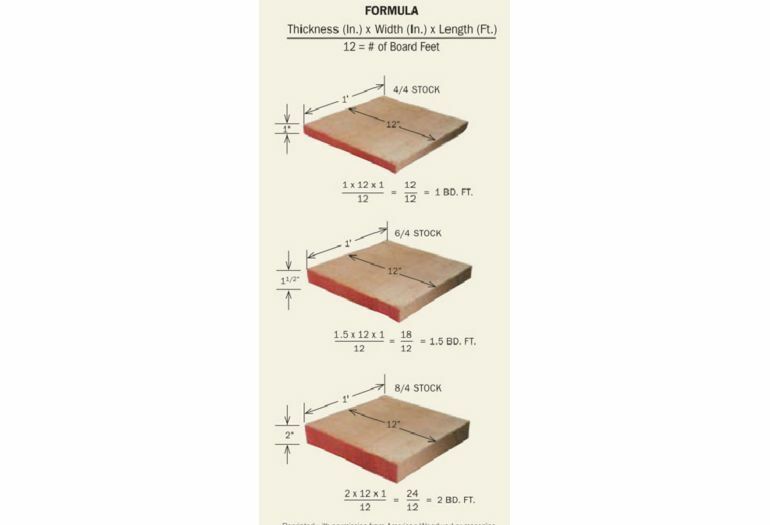 Learn how to figure board feet in your next stack of lumber below. Sawmillers and most suppliers use board feet as a unit of wood measurement. It's important for you to know and understand how to calculate board feet and board feet pricing for your sawmill business. It's important to remember that 5/4 stack-like deck plank, is considered thicker than 1" stock. This means when calculating board footage for 5/4" stock you must use 1.25 as the thickness instead of 1. When calculating the board feet in a random width product, such as oak boards, you use the actual width in inches, not the nominal width. Since you use the actual width in inches in the calculation you also enter the length in inches as well, then divide by 144, instead of 12 because there are 144 square inches in a square per board foot. Now you know how to calculate board foot in a piece of lumber. Learn how to charge per board foot in the How to Charge for Sawing Services article.